Unless waived by IWD, individuals are required to make a minimum of two job contacts each week. The work search requirement may be waived if an individual is temporarily unemployed and expects to be recalled by their former employer within a reasonable period of time or is in school and approved for Department Approved Training (DAT). The work search requirement will be determined each time a claim is filed. In order to meet the work search requirements, individuals must make two job contacts between Sunday and Saturday of the week they are claiming benefits. Contacts may be made in person, online, by mail, email or faxing résumés or applications. Telephone calls are not acceptable. The work search must be a reasonable and honest effort to find suitable work. Failure to perform an honest effort work search may result in the denial of benefits. Participation in reemployment services activities may qualify as a work search. Individuals must be willing to accept a reasonable wage for the job for which they are applying. An individual may not apply for the same position with the same employer more than once every six weeks. Individuals must keep a written record of all work search contacts for a period of one year and be ready to provide a copy if requested by IWD. Failure to comply may result in denial of benefits. Members of a union hiring hall are required to be in good standing and must contact the union in accordance to hall rules. Whether filing a weekly claim online or by phone, a four-digit Personal Identification Number (PIN) is required. This number is selected by the individual the first time a weekly claim is filed. The PIN must be four digits and cannot include the same number (i.e. 1111 or 3333) or numbers in a consecutive order (i.e. 1234 or 6789). The PIN protects a claim from being accessed by someone other than the individual and should be kept secure. Individuals should choose a PIN that is easy to remember since they will use this number each week they file a continued claim for benefits. NOTE: In some cases, a new PIN must be selected after reactivating an existing claim. Individuals must keep their PIN confidential and should never let anyone file their weekly claim on their behalf. Individuals should contact IWD to reset their PIN if it has been compromised. After you file your initial claim, file weekly claims online at www.iowaworkforcedevelopment.gov for every week you are unemployed or your hours are reduced. You must file a weekly claim for any week that you want payment even if your eligibility is being decided or you have an appeal pending. Payment will not be made for any weeks that are not filed timely. If a weekly claim filing is missed for one or more weeks, a new initial claim application must be filed. It is your responsibility to check the status of your claim during the week to ensure the prior week has been recorded. The current week is the week that just ended on Saturday. Weekly claims must be filed 8 am Sunday through 5:30 pm Friday for the prior week only. This means individuals have six days to file the previous week’s claim. See the chart above for the days available to file. Weekly claims can be filed online using a mobile device or computer at https://uiclaims.iwd.iowa.gov/weeklyclaims/. Delay in filing your weekly claim could result in denial of benefits. IMPORTANT: You will receive confirmation that the claim has been processed successfully. If you don’t receive confirmation, the process must be repeated until the claim has been successfully submitted. To calculate gross earnings, multiply the number of hours worked (Sunday through Saturday) times the rate of pay. Example: 10 hours X $12.00/hour = $120.00 in gross earnings. Individuals are encouraged to keep a piece of paper and pencil handy in case they need to write down any information during the process. This will be beneficial in case IWD needs to be contacted for any issues that may arise. Gross earnings or gross wages are your earnings before taxes or other payroll deductions are made. Earnings or wages must be reported on the weekly claim during the week the wages are earned, not when the wages are paid. Earnings must be reported even if the payment has not been received yet. To calculate the amount to report, the individual should multiply the number of hours worked by the hourly wage. Individuals should report the full gross amount of earnings and IWD will calculate any deductions. If an individual earns $15 or more over their WBA, they will not receive a benefit payment. Earnings are calculated differently depending on the type of income. See the chart on the right for general guidelines on deductibility. An individual may earn up to 25 percent of their WBA before the benefit payment is reduced but there is still a requirement to report all earnings even if under 25 percent. Earnings higher than 25 percent will reduce the benefit payment. Example: An individual’s WBA is $400 and they earn $370. 25% of $400 is $100. $100 is not deducted from the WBA. $370 - $100 = $270. The remaining $270 is deducted from the WBA. $400 - $270 = $130. $130 is the payment amount for the week. benefit payment by one dollar (dollar-for-dollar). Example: An individual’s WBA is $400 and they receive a $370 vacation payout for the week they are claiming. Even though these payments do not need to be reported to IWD, the individual must still maintain their eligibility as instructed in this handbook. Vacation pay is reportable for the first 5 work days following the last day worked. You must report vacation pay on your weekly claim, depending on the number of days of vacation pay you received. Vacation pay is applied to an 8 hour work day and a 5 day work week, Monday through Friday. If you received less than 5 days of vacation pay, you should report the amount and number of days that you received or will received. If you received less than 5 days of vacation pay, you should report the amount and number of days that you received or will received. If you received or will receive vacation pay in excess of 40 hours, you must take the total amount and divide by 5. * Total vacation dollar amount / 5 = dollar amount to report for each day. Income from self-employment is not considered wages and is not deducted from UI benefits. However, eligibility requirements must still be met. To receive UI benefits, an individual must be able, available, actively looking for work and willing to accept suitable work. If it is determined self-employment prevents an individual from accepting suitable work, they may be disqualified due to being unavailable for work. Individuals required to search for work must register for work with IWD online at www.iowaworkforcedevelopment.gov or at the nearest IowaWORKS center. Registration must be completed within ten days of filing the initial claim. Failure to complete a registration could result in denial of benefits. Individuals should contact IWD to report any changes that could affect their benefits. Individuals are required to search for and accept suitable work, unless waived by IWD. Factors used to determine if the job offer is acceptable include wage, length of unemployment, working conditions and job duties. The wage requirements for determining if work is suitable are calculated using the wages earned in the high quarter of the base period. The high base period quarter is divided by 13 (the number of weeks in a quarter) to calculate the average weekly wage (AWW). Example: An individual’s earnings in the high quarter are $5,200. To compute the AWW, divide $5,200 by 13. The AWW is $400 which equals $10 per hour in a 40 hour work week. Individuals are not required to accept any job offers that are below the federal or state minimum wage. EXAMPLE: If an individual is offered work that pays $290 per week ($7.25 per hour in a 40 hour work week) during the ninth week of the claim, the job offer is not considered suitable because it is below 75 percent of the AWW. When the individual files a weekly claim, they must report if they refused any job offer or referral during that week. Once the above information is received, IWD will determine if the payment is deductible from UI benefits. The first payment is issued approximately three weeks after an application for UI benefits is processed, if all the eligibility requirements are met. Payments may be delayed until all outstanding issues are resolved. When you file an unemployment insurance claim and have selected to receive payment by an Iowa Workforce Development (IWD) Debit Card a card will be mailed to you. The card will not expire for three years, so please do not destroy the card. If you have received a card in the last three years, the card is still valid and payments will be issued to that card. The IWD Debit Card provides the quickest form of payment for unemployment benefits. The benefit payment is deposited three to four business days after the weekly claim is filed, if all eligibility requirements are met. Holidays may delay the payment. You can also download the Bank of America mobile app to manage your debit card. Only IWD can update an individual’s personal information with Bank of America. Address or name changes should be reported to IWD. Card account balance and transaction history are not available to IWD staff. To report a lost or stolen card or order a replacement card, Bank of America must be contacted directly by the individual. In order to receive payment(s) into your checking or savings account, it is your responsibility to enter your account information when you file an unemployment insurance claim. This is only currently available for claims filed after March 31, 2019. The account number is correct and is associated with the account you want the funds deposited. In an effort to safeguard sensitive information, IWD will have limited access to updating account information. IWD will not accept any paper forms to change account information. If you do not enter your account information online when you file an unemployment insurance claim application, the IWD Debit Card will be the default payment method. Direct deposit cannot currently be added to an unemployment insurance claim unless you filed a claim after March 31, 2019. We are working on making updates to allow our customers to add and make changes to direct deposit at anytime while filing for unemployment insurance. Those options should be available in the next few months. The Child Support Recovery Unit may withhold up to 50 percent of an individuals UI benefit payment for a child support obligation. The individual is mailed a notification with the beginning date and the amount of the deduction. The amount withheld is included on the IRS Form 1099-G, since it was paid to another agency on the individuals behalf. Requests to modify or stop the deductions must be made to the Child Support Recovery Unit or through the court system. Individuals are responsible for repaying any benefits they were not eligible to receive. Future UI benefit payments are withheld until the non-fraud overpayment has been recovered in full. If the individual is not making attempts to repay the overpayment, the debt may be recovered by withholding state and federal tax refunds, casino and lottery winnings, and vendor payments. Overpayments caused by fraud include a 15 percent penalty. All overpayments are assessed interest of 1/30th of 1 percent per day until the debt is paid in full. Individuals with fraud debt are not eligible to receive benefits until the debt, including penalty, interest and fees have been paid in full. NOTE: Overpayment amounts include payments received by the individual and payments made on behalf of the individual to revenue agencies for tax withholdings or to the Child Support Recovery Unit. UI benefits are taxable. UI payments of $10.00 or more are reported annually to the Internal Revenue Service and the Iowa Department of Revenue and Finance. An Internal Revenue Service (IRS) Form 1099-G is mailed by January 31 of each year. This form provides important tax information that must be reported on the state and federal income tax returns, such as the amount of benefits paid during the tax year and the amount of state and federal taxes withheld. IWD can withhold 10 percent of the benefit payment for federal taxes and 5 percent for Iowa taxes. Individuals elect tax withholdings on their application for UI benefits. To make changes in tax withholdings, the Tax Withholding Agreement Form 60-0351 must be submitted to IWD. Studies completed by the U.S. Department of Labor found that people who received reemployment services returned to work earlier than people who did not receive services. For individuals that are required to search for work, IWD uses profiling to select individuals to participate in Reemployment Services and Eligibility Assessment (RESEA). Profiling looks at a variety of factors such as occupation, industry, education, length of employment, wages, etc. Participants are selected within the first five paid weeks of their claim. RESEA is designed to assure individuals are registered for work with IWD and to provide customized reemployment services. If selected, participation is mandatory as it is a condition of eligibility for UI benefits. Non-participation could result in a denial of benefits. Participants will receive a letter informing the claimant where to report and what documents to bring. Participants must contact their RESEA Advisor prior to their scheduled appointment if they are unable to attend. Appointments may be rescheduled for justifiable cause. A decision will be issued approving or denying the request. The decision will include appeal rights. Although the work search requirement is waived, the individual must continue to be able and available to attend school. The individual must also file a weekly claim to receive payment while they are in school. If training stops for any reason, the individual must notify IWD and begin making work search contacts immediately. ​TEB is only payable after all other UI benefits are exhausted. The TEB application and lists of high demand and declining occupations are available on the IWD website. Individuals who served on active military duty during the base period can file a UI claim in any state as long as they are physically present in that state at the time of filing. To add military wages to a claim, the individual must have served on active duty in the Armed Forces or served at least 90 consecutive days of active service in a US Military Reserve Force. The individual must provide a copy of their DD–214 (member copy 4) to determine if military wages can be used on the UI claim. Federal wages are not assigned to a state until after a UI claim is filed. An individual who worked for the federal government during the base period must report this employment when filing a UI claim. IWD will send a request to the federal employer to determine if the wages can be assigned to Iowa. Once wages are assigned, a new monetary record will be sent to the individual. Individuals who have worked in Iowa and other states during the base period may request to have their out of state wages added to the Iowa UI claim. Out-of-state wages will only be combined with the Iowa wages if the additional earnings will increase the WBA or MBA. The individual has the option to file in any state where an employer reported earnings for them during the base period. Individuals who move out of Iowa must immediately notify IWD of any address change. Mail from IWD may not be forwarded by the U.S. Postal Service. Individuals who are required to do work searches must contact the workforce agency in the state where they reside to register for work. Individuals should still file their weekly claim in Iowa. Benefits will continue to be paid by Iowa until the individual begins working, exhausts benefits or the benefit year expires. Trade Readjustment Allowance and Trade Adjustment Assistance are programs available for individual who are unemployed or underemployed due to increased foreign imports. Affected employers must be approved by the US Department of Labor. For more information contact a local IowaWORKS office or IWD. UI claims are confidential by law. Individuals may request a copy of their records by submitting a signed, written request to IWD or by contacting IWD by phone. Only general information may be given over the phone. Wage information may be provided to a third party only if the individual provides IWD with a written, signed request. As required by law, IWD will release information on UI claims to various federal and state agencies if requested. The tax form individuals receive indicating total UI benefits received and taxes withheld during a calendar year. Individuals who claim UI benefits must be ready, willing and able to work. They must be prepared to start employment immediately and be physically and mentally capable of working in order to receive UI benefits. A request filed by a individual, who has established a benefit year that has not expired, to reopen a UI claim after a period of employment since the filing of individual’s last UI claim, provided that benefits were not previously exhausted. One or more additional UI claims may be filed during a benefit year. The IWD official who conducts UI Appeal hearings. The right of interested parties to challenge a determination on the basis the determination is not legally correct or has been based on incorrect or incomplete facts. All appeals must be in writing, and must be filed by the specified deadline. A formal proceeding held by an Administrative Law Judge to consider an appeal of a fact- finding decision concerning benefits or an employer’s tax liability. 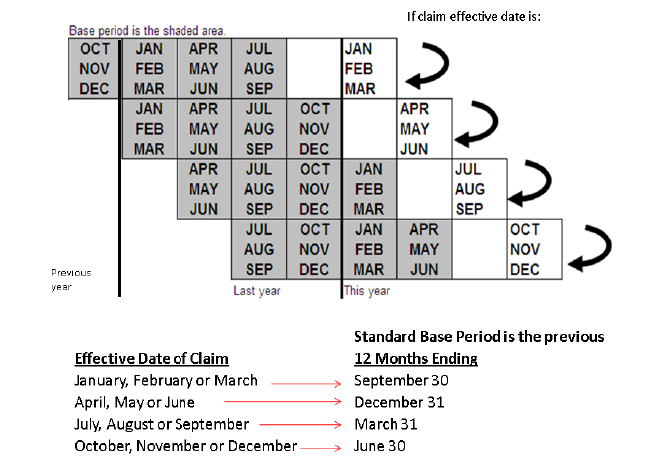 The alternate base period is the four completed calendar quarters prior to the calendar quarter in which a claim begins. The base period is the first four of the last five completed calendar quarters before the calendar quarter in which the claim begins. The amount of UI payments an individual receives each week. A calendar week, it starts at 12:01 a.m. Sunday and ends at midnight the following Saturday. The one-year period beginning with the Sunday in which the valid initial claim for UI benefits is filed. It is during this period the individual may receive up to 26 full weeks of benefits. An individual can start and stop claiming weekly benefits as many times as necessary during the benefit year. This is called a break in reporting status. Any break in reporting requires the individual to file another initial claim application to reactivate their claim. The three-month periods beginning with January, April, July and October. To receive a benefit payment after filing the initial claim for benefits, the individual must certify their eligibility by filing a weekly claim. An Iowa claim in which the wages earned during a base period in Iowa are combined with the base period wages earned in another state to qualify for benefits or to increase the benefit amounts. Iowa wages transferred to another state for use on a UI claim. Work performed for an employer who is subject to the Iowa Employment Security Law and who pays UI taxes. It is also known as insured employment. Wages paid to an employee by an employer who is required to pay UI taxes. An individual attending school or a training course submits a written application to IWD requesting the work search requirement be waived. If the application is approved, the individual must continue to file a weekly claim to receive UI benefits while attending training. If training stops for any reason, the individual must notify IWD and begin making work search contacts immediately. Any individual who was claimed on the prior year’s income tax return. A decision on a request for insured status, a UI claim for benefits, or any UI issue. The date a determination is made. A individual becomes unemployed as a result of a declared disaster and lacks the necessary earnings to qualify for an unemployment insurance claim, the individual may be eligible to receive benefits based on non-covered wages. The date the individuals benefit year begins. UI claims always begin on a Sunday. Usually, it is the Sunday of the week in which the UI claim is actually filed. On appeal, the Employment Appeal Board reviews UI benefit decisions made by an IWD ALJ. It is appointed by the governor and confirmed by the Iowa Senate. One member represents employers, one represents employees, and one is a representative of the public. Located in the Department of Inspections and Appeals. An individual has earned excessive earnings if they earn $15.00 over their WBA. For any week with excessive earnings, they will not receive a benefit payment. If an individual reports excessive earnings during four consecutive weekly claims, the claim will need to be reactivated before payments can resume. An Iowa UI Division employee who makes determinations of eligibility on a UI claim. An informal interview, usually held over the phone, in which both the individual and employee present information regarding the initial claim. A claim in which there are wages earned from a Federal employer during the base period. IWD will send a request to the Federal employer to determine if the wages can be assigned to Iowa to be used on a claim. The willful misrepresentation or nondisclosure of a material fact by a individual for the purpose of obtaining benefits to which the person is not entitled. An application by a worker for a determination of eligibility for UI and computation of weekly and maximum benefit amounts. The calendar quarter immediately before the quarter in which the UI claim is filed. The total amount of UI benefits available to an individual during a benefit year. A claim in which there are military wages earned during the base period. The individual must have served on active duty in the Armed Forces or served at least 90 consecutive days of active service in a US Military Reserve Force. The individual must provide the agency with their DD214 (member copy 4) to determine their eligibility. Eligibility for UI benefits based on the gross insured wages paid to the individual in the base period. The maximum and minimum benefit amounts are determined by law and are subject to change each year. UI benefits received by an individual who was not entitled because of disqualification, earnings or for other reasons. A notice to IWD about a potentially disqualifying eligibility issue for UI benefits. Protest on a claim may be initiated by the employer, the individual claiming benefits, or by IWD. Any break in filing weekly claims (break in reporting status) will require the individual to file another initial claim application during the week they want to start collecting benefits again. Any employment during the break must be reported. Individuals may be disqualified for failing to accept an offer or referral of suitable employment. This is a requirement for most individuals who are not attached to an employer or a union. All individuals are required to complete a registration on IowaJobs.org. Failure to register for work can result in denial of benefits. If an individual worked during a week they are filing a weekly claim for benefits, they must report gross earnings/wages (before tax and payroll deductions). Earnings should be reported during the week they are earned even if payment has not been received yet. Individuals should report their full amount of earnings and IWD will calculate any deductions that may apply. A process by which a individual may establish eligibility for UI through reemployment following a determination of ineligibility and a period of disqualification. To be eligible for a second claim year, individuals must earn wages in covered employment of at least eight times their weekly benefit amount since the effective date of their previous unemployment claim. Income from self-employment is not considered wages and is not deducted from unemployment insurance benefits. However, eligibility requirements must still be met. This means the individual must be able, available, actively looking for work and willing to accept suitable work. If it is determined self- employment prevents an individual from accepting suitable work, they may be disqualified due to being unavailable for work. When an employer pays a laid off worker for dismissal, termination, or separation and includes wages in lieu of notice. This is 100 percent deductible. Training Extension Benefits (TEB) to receive an additional 26 weeks of UI benefits. Application for TEB must be submitted in writing to IWD before the UI claim expires and is only payable after all other UI benefits are exhausted. Programs available for individuals who are unemployed or underemployed as a result of increased foreign imports. An employer must be certified as Trade eligible by the US Department of Labor. An application for UI benefits that meets all the eligibility conditions specified by the law and establishes a benefit year. the definition of wages in Section 96.19(41) of the Iowa Code. The amount payable to an individual for a payable week of unemployment.